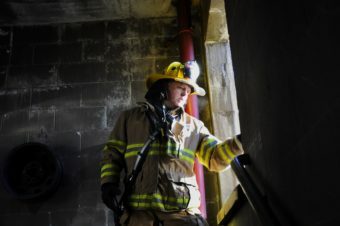 Capital City Fire/Rescue and Juneau members of the International Association of Fire Fighters (IAFF) held a day-long training session designed to introduce non-firefighters to the rigors of their job. Called Fire Ops 101, the event at Juneau’s Hagevig Fire Training Center on Feb. 1, 2014 featured scenarios that included climbing a ladder truck, defensive hose operations, ventilating a roof, entering a structure with a hose for fire attack, interior search and rescue, and responding to a typical medical call. Invited participants included CBJ employees and Assemblymembers, and members of the Juneau media. KTOO’s Matt Miller chronicled his participation in the exercise with a portable audio recorder and a GoPro camera mounted on his helmet while KTOO’s Annie Bartholomew photographed the event.